It’s been slightly more than two years since Desperate Journalist’s self-titled debut, and my haven’t they grown. 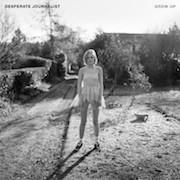 It’s more of the same to be fair, though there’s an assuredness on Grow Up that comes with experience; an indelible imprint of a band not only making their mark, but also asserting their identity. The songs feel bigger, better, more expansive and fresher, while their collective deportment has something of a swagger about it. What’s perhaps most remarkable is the fact that each player has a distinctive voice, and with the ear able to discern and separate the parts, it creates an eerie space in which the listener can move around in. Jo Bevan is winsome sometimes and downright spiteful at others – but her delivery is never anything less than emphatic, as one has come to expect from romantic indie pop’s newest poète maudit. Rob Hardy’s empyrean guitar licks seem to ricochet off the wings of angels, while Simon Drowner’s fuzzy and unfussy grooves lock in tightly with Caz Hellbent’s sturdy rhythm. The production, provided by the band and Keith TOTP, has done a fine job of accentuating their strengths, although you’d be hard-pressed to identify too many weaknesses. If there is a criticism, and it’s a backhanded compliment (or maybe a front-handed insult), it’s the fact that they never soar on the rest of the album quite as majestically as they do on the first three tracks. Though – given that said tracks have been three of the best singles released since, well, their last three singles – it would be churlish to kick up too much of a fuss. ‘Hollow’ is an imperious opener, which juxtaposes the ambient groove of the verses with an almost hysterical chorus, with Bevan howling the titular word ever more frantically. In a strange way it nods to the repetition at the outset of Oasis’s What’s the Story (Morning Glory), though where they invoked Gary Glitter with the word ‘Hello’, perhaps Desperate Journalist are invoking Tim Burton with ‘Hollow’. It’s certainly goth enough. ‘Resolution’ is even more arresting, and if the charts mattered nowadays beyond being filled up with bland Suffolk singer songwriters with odious Care Bear tattoos, then this would surely make a dent in the top ten (in any sane world, the top 3). Preposterous though it might sound, ‘Resolution’ has the kind of anthemic indie theatrics that would make it the perfect goal montage music for Match of the Day (someone needs to have a word so they can buy their mums houses). ‘Be Kind’ also seems to be nodding - this time to Nirvana’s ‘All Apologies’ in the verses - with a chorus that demonstrates a musical cunning that’s all their own. It takes a certain amount of confidence to cling to the same chord for dear life, and by the time it resolves and the bridge arrives, your heart bursts into a pulpy mess. There’s a little bit of, dare I say it, Gene in there too, though Gene were at times majestic, and they share the same doomed ambition as Desperate Journalist. The flipside to the wistfulness is Bevan’s withering putdowns. One minute she’s imploring you to be kind, the next she’s asking some poor darling ‘Why Are You So Boring?’ Meanwhile ‘Your Genius’ is about someone who’s clearly convinced of their own brilliance where perhaps nobody else is, and ‘Lacking In Love’ promises to give the poor protagonist “something to cry about”. Lyrically it’s maybe less abstract and more human than last time around, while the voice is truly something to behold these days. On ‘Purple’ Bevan’s vox captures some of the resonance and poise of Alison Moyet, and much of the expressiveness as well. And we can’t offer higher praise than that. On ‘Purple’ an interesting thing happens too. At the end of the chorus, just for a moment, the band chime into the strangest of augmented chords. For that nanosecond they threaten to step into another musical world altogether, but then return to what they know they do so well. Grow Up is as perfect a record as they could have made right now, but perhaps that single strummed phrase is a portent that things could get weirder when they’re fully grown.